I’m sorry, I had to go with the Confederate statues. The left is trying desperately to cut an entire section of this country out. Sadly, they may succeed. They do not realize that IT DOES NOT MATTER WHAT STARTED THIS WAR. There were heroes on both sides, the Confederacy lost, and IT’S OVER. The South will not long put up with being demonized for a war that happened 153 years ago. Not even those cities that elect liberal mayors. Agree, d_d, that this train wreck is more significant than many realize, given that it will not stop with the Confederacy; our entire history must be purged of any possible offense to the perpetually offended. All for our own good and in accordance with the general will, of course. Sadly, I was thinking the exact same thing when I wrote it. Note i did not say THE catalyst… just one of them. I voted for the 2016 post election train wreck, because I think at least several of the others are part of its pile. I doubt we’d have the Harvey Weinstein train wreck if Trump’s election didn’t make Bill Clintonesque behavior uncool, and the Kavanaugh train wreck is certainly part of that pile-up. Likewise, the immigration train wreck has been given an extra push with the resistance wreck slamming into it. I don’t count the confederate statues or Sandy Hook as part of the pile-up because they’re not as closely connected to the Trump Resistance itself. I agree, Gr. Weinstein would be Ambassador to Slovenia and Kathy Griffin and Lena Dunham would be on the Supreme Court if HRC had won. Each of these deserves the top spot it would have gotten in a better time, but some affect more right now. Perhaps “all of the above” should’ve been a choice? Nah, that’s weaseling out, I guess. Yeah, but it was incredibly hard picking one. I’ve figured out why I can’t vote for any of them to be the top dog, it’s because there is an underlying core that is the cause of all of them and that’s not on the list – brainwashing due to emotionally charged propaganda. So “Which 2018 Ethics Train Wreck did the most damage?” I vote emotionally charged propaganda. The six Train Wrecks on the poll above wouldn’t even be Train Wrecks if not for the massive amounts of emotionally charged propaganda associated with each one. Social justice warriors have already won the battle of the minds, and that’s been their goal since the 1960’s! Indoctrinate the youth and you have them forever. The indoctrinated youth of the 70’s, 80’s, and 90’s have been dumbed down and are now the adults running the country. Attempts at totalitarian control can’t be far behind. Remember the book “The Deliberate Dumbing Down of America”, well it appears that Charlotte Thomson Iserbyt wasn’t such a wacko after all. Be honest with me, have I fallen off the edge of reality. Antiology destroys everything in its’ path and the antiology of social justice warriors is a cancer to our society. This made for a difficult decision. Each has its own problems but I chose Kavanaugh because it seemed that enough people were persuaded to discard the entire notion of presumption of innocence, embraced the notion that women would not lie about such events, and that we made males and females even more suspicious of each other. They’re all awful, but the post-election trainwreck continues to roll. No contest. I chose Post Election train wreck, mainly because it seems to be the “head” of all the others. I think historians will some day mark election day as the beginning of the end of modern civilization. It seems to have had a domino effect, tipping all the other things with it, resulting in hysteria and loss of rational thought by the ‘tolerant’ left. I think historians will some day mark election day as the beginning of the end of modern civilization. Only U.S.-centric historians will do that, and even then only if they do not share Oscar Wilde’s view of such things as regards the U.S.A.
She of course only meant those that are examining American events. I think it is fair to say though that “We are all Americans now”. I don’t know if anyone has said that but it is ripe for saying. The World Conversation revolves around American issues. The entire world seems to talk almost exclusively of American Events. No. See https://quoteinvestigator.com/2011/12/07/barbarism-decadence. That renders the remainder of your discourse a red herring. The Quote Investigator focuses on another quote, not the one I selected. I am uncertain if you mean that all the quotes said to be Wilde’s are not? Or that Wilde repeated ideas that others had expressed? What is ‘Oscar Wilde’s view of such things as regards the U.S.A.’? It is not a ‘red herring’ to make a mention of a phrase like ‘We are all Americans now’. It is an opportunity to examine certain facts that have to do with influence, the power of discourse (even if it is totally inane), and of course of Modernity. A fuller response inspired by your references to Wilde and Michelle Klatt’s *the end of civilization*. Which 2018 Ethics Train Wreck did the most damage? (The hamburger does not compare to the advertisement photograph). Looking at the hamburger is the same as looking at the contingent events mentioned above. What produced the wilted, pathetic hamburger, is a long causal chain. But the wilted, pathetic hamburger will not be able to tell us anything about the long causal chain. The wilted, pathetic hamburger ‘stands mute’. Similarly, Trump’s election, the Kavanaugh Hearings, the Toppling of the Confederate Monuments, the ‘Me-Too Movement’ cannot, in and of themselves, reveal more than superficialities. Something is producing all of these. I just am not sure what it is. Allow me to ask in complete sincerity: Do you completely disregard or deny, in an absolute and thorough sense, the terms of discourse of the Left? You would agree, then, that the enemy is motivated by something other than its stated motivating principles. The tricks it uses to nullify contradictory thought openly nullify all thought. It’s impossible that they can be the effect of a consistent internal logic. Do you think it’s an organized cabal pulling the strings of people with an inordinate desire for belonging, or is it simply the effect of mass late stage nihilism? It is true that an empowered fool will choose whichever truth seems most convenient at the time. I wonder if this is the effect of democracy itself then. Plato spells that path out in his Republic. The willful, unguided by intellect, could self-organize into a lazy mass which demands that which it hasn’t produced by voting for it – resulting in a feedback loop which wrecks civilization and leads to tyranny. It’s usually hard for me to imagine a tribe of dependents desiring to share its dependency with an increasing mass, though. I usually suspect that this is a sign that the tribe is commanded by some sinister manipulating inner circle with an unseen ulterior motive. I suppose it’s possible that the whole pattern is unconscious, though. If the tribe is so unmoored from intellect that it can’t conceive of the reality that division by an increasing value approaches zero asymptotically, and it thereby has an unchecked sense of pity, then it could reasonably demand that the engine it taxes be taxed further to cover the needs of all without the need of manipulative forces to explain the now-resolved contradiction. If these premises are true, the whole mechanism can be described as an engine of vice. The nihilism was simply a mid-stage product and means of further self-perpetuation. I have a knack for over-simplifying these things, though. Wow. You ain’t from around here, so you don’t know the ant hill you just kicked. I am popping popcorn and waiting for Alizia to reply. I’ve spoken with her a few times before. She has a line of reasoning that I think tends to get to the heart of these things. I’m very interested to know if she has a different opinion of this mechanism. I’m not actually sure about this myself, and a bit of scrutiny could do me some good. I’m afraid it’s too naïve and simplistic – like there’s a contradiction I’m overlooking. Still, a mob degraded and moved by vice would behave erratically like addicts. Maybe I’m afraid it’s wrong but unfalsifiable, or right but can’t be confirmed because it’s unfalsifiable. I liked to kick ant hills as a kid, and I’d still do it today if I thought anti-nominalists would come out of them. To understand the reference to anti-nominalists appearing out of anthills, this essay titled Witches on the Heath: Abandoning the Transcendentals will help. The defeat of logical realism in the great medieval debate was the crucial event in the history of Western culture; from this flowed those acts which issue now in modern decadence. That is why the consideration of ‘the causal chain’ that is producing all these dancing contingent issues we all obsess over, is a fruitful endeavor. You would agree, then, that the enemy is motivated by something other than its stated motivating principles. The tricks it uses to nullify contradictory thought openly nullify all thought. It’s impossible that they can be the effect of a consistent internal logic. Do you think it’s an organized cabal pulling the strings of people with an inordinate desire for belonging, or is it simply the effect of mass late stage nihilism? I think that we have to start from the presumption that we live in a system that employs propaganda. Meaning, contrivances, lies, distortions, partial-truths. The advertising world is built on these (though not all, obviously, is deceptive). It seems to me that there is no other general *lesson* that has struck people, and eroded their trust, than the understanding that when needed, when expedient, they will be lied to. In fact we do not trust. And we should not trust. A fool trusts blindly. This is the basic fact. Any trick used to deceive will, be definition, if not nullify thought, corrupt thought. I get the impression that most everyone sees that general education is in a state of total mess. Who is being trained to think correctly? The tricks it uses to nullify contradictory thought openly nullify all thought. Do you think it’s an organized cabal pulling the strings of people with an inordinate desire for belonging, or is it simply the effect of mass late stage nihilism? That is the maddening question, isn’t it? What I can say is that 1) I am inclined to accept the view that invisible groups have a tremendous power and that their use of power is extra-democratic (para-democratic). But 2) that it is hard to see what is, by its nature, invisible and clandestine. See Michael Barkun A Culture of Conspiracy: Apocalyptic Visions in Contemporary America. If these premises are true, the whole mechanism can be described as an engine of vice. The nihilism was simply a mid-stage product and means of further self-perpetuation. I think that one can only attempt to speculate and to theorize. I am somewhat certain that the System that operates in our present employs vice as a tool of political control. But I would also expand the notion of vice to ‘distraction’ and to ‘the spectacle’. I appreciate the ideas of E Michael Jones who writes on this theme (and his ideas cannot be any part of mainstream national discourse for this reason). But, I also have certain suspicions about his orientation. It’s not a terribly controversial idea, and, like most other subjects, it got me to thinking about the nature of grand-scale human error. Anyone habituated to evil acts will tend to the idea that his acts are normal and react rashly and unintellligently toward arguments to the contrary. It’s seldom possible to talk a cocaine addict out of his addiction. An addict in a position to remove negative remarks about cocaine addiction from school textbooks would surely do so in an atmosphere in which his addiction is seen as a viable lifestyle choice if there were enough of the likeminded occupying other key positions. Some small semblance of this could have occurred every year since the “”Enlightenment””, and our social fabric would have fallen to this state through mere attrition absent some authoritative moral voice with binding force. There’s more viability here than I thought I’d find when I started this experiment. I’m afraid I’ve accurately described the globalist elites through their self-contradictory words down to their absence of an ideological bedrock. I’d very much like to go back to being committed to the idea there’s a malevolent evil somewhere on earth ripe to crusade against (Deus Vult! ), but now that I’ve seen this it’s hard to un-see. It’s as potentially disappointing as the Mandarin in Iron Man 3, but it’s real life. I guess it would still kind of be a conspiracy. I certainly get your references to Thomas Aquinas, to the Stereopticon, and then to Feser. We share some background that makes it possible to converse and to go into different dimensions of these issues. It might be useful if I share a small anecdote. I spent a number of months looking at the evidence, and the narratives, that present a certain picture of the 9/11 events. In one of them after going through his personal process of encountering his own wall of disbelief, meaning that when he came to realize that the described event was very different from what was described, his ‘world collapsed’ and this threw him into a maelstrom of doubt, confusion and uncertainty. That is why I mentioned Michael Barkun’s book (which I did read). In doubting ‘the official story’ (which is pretty evidently a series of lies) he had to develop his own interpretation. And here is where the problem lies. This really is a profoundly hermeneutical issue . . . In this man’s case he was hinting, more or less, at para-governmental and therefore to concerted efforts to manipulate perception at very large levels. Not only to manipulate perception, which certainly happened, but to terrorize, to shatter trust and certainty, and to create a perceptual situation in the face of which one can do nothing but stare with open mouth. You do not know how to interpret the event, and in that chaos of perception, you will naturally incline to accept the received, official line. It has everything to do with the most tyrannical use of power that can be imagined. It is — if it really did happen in that way — tyranny in motion. Therefore (and I am not suggesting a conclusion as I do not know what *really happened*) we have to stop and consider what it means to live within the Stereopticon system. We do not really have a choice. The question though is in how far we will go. So, as I have progressed in my interpretive effort, I have come to see just how very much it is very much that sort of effort. That is, What is this world? What kind of a place is it? Who can describe it? As you know — by reference to the positivists — you invoked the contrast with the Thomists and the metaphysicians. And you indicate that you understand that pole, that orientation-of-view. And therefore you would be able to understand — you do seem to understand — the original grounding of Christianity, as for example that expressed in the Catechism of Trent. Therefore, Ephesians 6:12 has a specific meaning in that it describes not a metaphor but *real things*. Personally, I know I think beyond any doubt that my struggle, my inner struggle that is, is “against principalities, against powers, against the rulers of the darkness of this world, against spiritual wickedness in high places”. But insofar as these impinge on me, which is entirely an inner issue. But how to interpret the world that surrounds me? or the kosmos? or the politics of a world that seems to be moving in the direction of a dystopia. We all know this, in one degree or other, but we do not know how to interpret it, or perhaps apply the interpretation, in a larger sense. I’d be especially pleased to hear there’s a manipulative enemy to be targeted specifically, and I’m definitely not convinced there isn’t. But the ‘manipulative enemy’, if we are to be specific, is non-material and metaphysical. You cannot put your finger on it. It cannot be located positively. In order to be able to hold that thought there must be a ‘metaphysical dream of the world’. And this is where, on one hand, such views border into paranoia and are the stuff of schizophrenic delusions. (That is essentially what Barkun is referring to). However, it must be said — it follows from the core assertions — that it is invisible powers that create evil situations. The purpose is to thwart what is their opposite. But what is that? What is the opposite of invisible entity that induces people to evil machinations? That is where the Thomistic analysis — the Thomistic psychology — comes into focus. I also say that this is the *core* around which an idea of Renewal revolves. I mean *European Renewal*. Because these are the basic European categories. I open myself up — naturally! — to a certain ridicule with the strange ideas I have just expressed, but I don’t mind. I’d rather take chances in my hermeneutics than remain bound into limiting view. Mejor dicho: Their purpose is to thwart what is their opposite. But what is that? What is the opposite of invisible entity that induces people to evil machinations? I think ridicule for the deft splitting of that hair is a badge of honor. You’ve found a fine Thomistic path, an Aristotelian golden mean, between my two seemingly opposite perspectives. Rather than a conspiracy theorist’s tangible intelligent malevolence or a Darwinian’s intangible unintelligent malevolence you posit the far more traditional theory of an intangible intelligent malevolence. Less polish on the steel of my blade and less dust on my rosary are probably called for (as usual). I fear a European Renewal may be called for. Chesterton’s opinion of the first one is that the old pagan moral errors which had been preserved in their symbolic understanding of nature had to pass away from memory in the crucible of a century or more of plague and barbarian incursions, all the while guided by the lights of the Church’s spiritual teaching and preserved Roman law. Few of those pieces are in play, so let’s hope it doesn’t come to that. Thanks very much for your affirmative comments! What I myself find really weird and hard to manage (if that is the right word) is the contrast or division between ‘pagan energy’ or will, and the Christian mission in Europe. I don’t know what you read and what you expose yourself to, but I have tried to follow and understand the more radical movements whose doctrines and ideas come, overall, from Europe. There is a connection between radical Catholic/Christian traditionalism and its resistance to certain liberal forms, and that of a general ‘pagan’ resistance to globalist [sic] projects. I cannot figure it out. I have to admit that I like and respect Jonathan Bowden (here is a 13 minute excerpt — with soundtrack! — of a talk that encapsulates some part of how I understand ‘Renovation’). If you listen, please do offer some comments. I would be very interested to hear your impressions. But Bowden, though raised in Catholic schools, describes himself as a Nietzschean and a pagan. But he does understand the power and relevance of metaphysical and transcendent value and their necessity in cultural renovation. (The excerpt is part of a longer talk he gave called ‘Western Civilization Bites Back’. It can be found, if you are interested, through a Google search on YouTube. The talk is worthwhile even for those who oppose these tones of radicalism which are, in our present, understood as dangerous and morally questionable. This is, to put it frankly, illegal material and the stuff of thoughtcrime). I think that’s very much correct. He spells out the cultural deconstructive mechanism well. I’ve even heard something to the effect of what he said about Eastern Europe somewhere before, but he fleshed it out further. Having endured the brutal extreme, they’ve become inoculated to the effeminate, self-imposed variety. It sounds a great deal like the idea I was describing of the West enduring the purgation of plague and Germanic raids. Maybe the work has already been done. Poland and Austria are certainly posing some resistance to the current madness. There is a connection between radical Catholic/Christian traditionalism and its resistance to certain liberal forms, and that of a general ‘pagan’ resistance to globalist [sic] projects. I cannot figure it out. It might hinge on the meaning of ‘pagan’. In Chesterton’s gloss he was referring to the tired, degraded Roman sort that had attached its mythology and decadence to nature itself. To look at the forest, one would think of Pan and the seasons recalled the story of Demeter tricked by Hades’ guile. In context, he was distinguishing St. Francis’s placing the material world in the Catholic scheme of creation from the tired, degraded early 20th century English tendency to unite him with those Roman symbols and call him a pantheist. The Religion of theologians and philosophers is more than able to distinguish a relatively good paganism from a relatively bad one, and we tend to recall this when we exclaim Carthago delenda est at certain beyond-the-pale enemies. I don’t know much of Bowden or the degree of his Nietzscheanism. I think initially I’m wary that he possesses Nietzsche’s attitudes toward meaning and will to power. I’d be concerned that the metaphysics were a means of cultural renovation rather than the cultural cohesion following from a true metaphysics. I’ve heard interpretations of Nietzsche lately that seem to run counter to my present attitude toward him, though. I’m not versed enough on the subject to have a strong enough opinion to warrant turning away allies. The Religion of theologians and philosophers is more than able to distinguish a relatively good paganism from a relatively bad one, and we tend to recall this when we exclaim Carthago delenda est at certain beyond-the-pale enemies. These are very interesting questions. I have to admit to a certain confusion. Having read people like Julius Evola, René Guénon, Savitri Devi, and others, I do not know how to incorporate their views. Julius Evola went to the very edges. René Guénon’s ‘The Crisis of Modernity’ is a vey good book and had a strong influence on me. I do have to say that, at times, many Roman Catholic exponents do not seem to have a cohesive and militant plan. What I mean is they do not seem strong in the face of the (so-called) *liberal acids* eating away at Europe and ‘the Occident’. It would be wonderful to combine, say, Christopher Dawson, René Guénon and Jonathan Bowden . . .
As to Bowden, and thinking about it a few minutes, I don’t think he would be very helpful in the sort of cultural renovation that has inspired me as possible (Christoper Dawson has been my largest influence). He was quite brilliant, no doubt, but definitely a reactionary. And as a reactionary somewhat out of control. (He died very young BTW). I have to admit to a certain confusion. Having read people like Julius Evola, René Guénon, Savitri Devi, and others, I do not know how to incorporate their views. Julius Evola went to the very edges. René Guénon’s ‘The Crisis of Modernity’ is a vey good book and had a strong influence on me. That’s almost unfairly kind, but I appreciate the politeness. We have the Catholic equivalent of Barack Obama currently at the helm bowing to Maoist whims. He was installed by a conspiracy of corrupt cardinals, and I’m to understand that their numbers have increased since. I don’t really see Catholicism as a weapon to beat back the barbarian hordes (though it should be) so much as I see it as the fortress under siege. Even so, our roots are deeper than ocean trenches and our walls are older than any existing nation. The enemies within can barely cause superficial damage while twisting themselves in knots avoiding excommunication at the charge of formal heresy. We’ve had a dynasty of Borgias, before that there was a time nearly half of all bishops were Arian, but they’ve all left no mark on the Tradition. This is the stability offered by a robust and holistic governing philosophy, bolstered by divine protection of course. Besides, their cover’s blown (viva Vigano!). It was revealed very shortly after that last scandal broke that the sort of priest who preys on children, the sort of priest who’s a darling in the media, and the sort of dissident priest who was planted in seminaries by communists in the Cold War are, with a few exceptions, concentric Venn circles. What’s worse for them is they’re not replenishing their numbers with the young. With church attendance not being a given anymore, the watered-down clown Mass just doesn’t have the appeal it once had. Current seminarians are disproportionately traditionalist. Even without a harsh internal Inquisition (which was well-deserved even many decades ago) the problem solves itself when the last of the baby boomers dies of natural causes. Which or course means my Church won’t be ready to take its rightful place as rallying point of the very Western civilization it birthed for at least another decade. I expect it will be considerably leaner too. If you examine the first chapter, immediately you will notice that he establishes a cosmological view and, obviously, a metaphysics. It is based on the Vedic idea of huge time-cycles and courses of evolution. Oddly, René Guenón lived in Egypt as a Muslim. Perhaps most involved with Sufism but I cannot remember. However, his intense French rationalism enables him to explain his views in extraordinary detail. This book is pretty accessible. My impression of what I think is its companion volume — The Reign of Quantity and the Signs of the Times — is that it is much less accessible. It was a much harder read for me. Very abstract. I think it was Christopher Dawson who said that in *our traditions* (Greco-Christianity), the Judaic side, if I can describe it that way, is the side that opens up into, and back into, the very recesses of human time. Greek rationalism, though it has its ancient roots, still seems to begin there, with itself and all its categories. In many ways this rationalism stands in contradiction to everything Judean! The Bible itself, the Egyptian traditions and knowledge, Babylonia — all of this is, in fact, the ancient ‘pagan’ world. The idea struck me because, at least in my mind, it would mean that all ancient knowledge is in its way present, considerable (‘that which can be considered’). I think this is what Dawson meant. The Vedic view of ‘the cosmos’, of Time, and indeed of Reality, is in my view far more expansive and encompassing, and it has occurred to me that the Christian world-view is, in its way, simplified or reduced, even radically so. The Cosmology of the Vedas is very much more expansive than that offered in Genesis. Yet — and this is another odd point — even with a reduced and simplified cosmology, more was made of it by the Occident (I use the term *Europe* as a catch-all). I have to say that I am confused by the *standard Christian declaration* (though I identify as Christian and am very involved in Catholic thought) that all these other traditions and view are inherently wrong or evil. Not sure if you have listened to Fr. Chad Ripperger, but for all his impressive genius (there is no one I am aware of that lectures as he does on Catholic/Christian doctrine and, of course, Thomist psychology), I do not think he could consider any other ‘worldview’ but the Catholic one, and would, to be frank, consider them very misdirected. (On the Doctrine of the Modernists). The purposeful *limitation* it demands is radical. 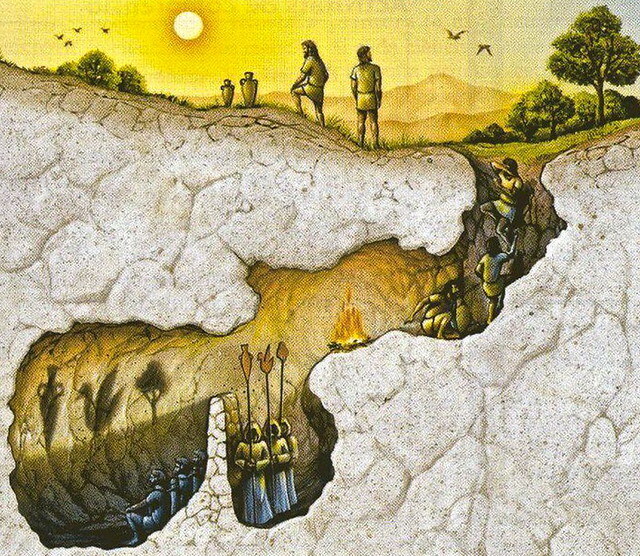 Plato’s The Myth of the Cave. I’ll be looking at that with greater depth when time allows. I look forward to reading it. I understand the “standard Christian declaration” well, and I think I can speak to that. Despite being standard, I don’t think the declaration reflects the Christian tradition. I once heard Rome described as sitting at the intersection of Athens and Jerusalem. Traditionally, faith and reason are to be complimentary whereas the constant temptation is to put them at odds. I risk sounding like a redundant fanboy (which I am), but I think St. Thomas Aquinas is the best exemplar of this ideal. He’s a well-known intellectual, but he was also a well-known mystic. At the time he was bringing Aristotle into the West, the West was resistant. Islam, which was at its short-lived intellectual apotheosis at the time, was considered Aristotelian, so St. Thomas’s efforts were viewed with suspicion. His commentaries are animated, motivated, and marked by an attitude that even in the worst works some element of truth is present which can be found and learned – bearing out the visionary words to St. Peter “Do not call unclean what I have made clean” but also an attitude of Aristotle’s which was particular among philosophers. The Church has officially recognized itself as classically theistic and with that comes the divine simplicity. Truth, Goodness, Beauty, and Being are all One, and this all men know to be God. All truths, therefore, are not just His but a particular mind-bogglingly immanent/transcendent instance of Him. The “standard Christian declaration” in this case is the standard Christian failure, and I do admit it is standard. That’s a very good talk. It also reinforces my attitudes toward nihilism and contrasts with the Nietzsche-merely-as-prophet-of-a-consequence-of-the-death-of-god idea I’ve been encountering. Introducing me to Fr. Ripperger simultaneously (I’d only ever been vaguely familiar with his name previously) crystallizes my interpretation which had only been vague and half-recognized before. I think the rejection of the notion of an ultimate Form of the Good is precisely both the original sin and the cause of the Luciferian fall. Genesis uses the phrase “knowledge of good and evil”, but Hebrew tends to be a heavily loaded, idiomatic language difficult to render fully in translation. The classical understanding is a sense of freedom-to-label-as-good-or-evil-for-oneself. The idea that nihilism is the expression of diabolism philosophically came especially easily after Fr. Ripperger’s assertions that our current elite (even of both “parties”) practice not just the vague, oft-asserted idol worship of valuing dollar before God but in literal diabolical rites. Finding the degree of truth to that will fill a later weekend, I’m sure. I think the reason for the cave’s absence is it’s natural theologic, man-climbing-to-God nature. The Jewish roots of Christianity are nearly entirely, taken at face value, an instance of that transcendent Form of the Good reaching down toward man. It’s revealed theology. However, I think the book of Ecclesiastes has, though not the whole of the idea, a great deal of parallel. I do not think he could consider any other ‘worldview’ but the Catholic one, and would, to be frank, consider them very misdirected. I think there are layered understandings of Christianity which could be corresponded to the levels of understanding within the cave (schackled, behind the wall, climbing the steep incline, seeing the Sun, etc.). I think this is a consequence of the fullest root claims of the Religion. St. Paul, in the Acts of the Apostles, attributes the statue of the Unknown God, to be the God of the Old and New testaments. I don’t think this is for nothing. The traditional understanding of this is that this Unknown God was an intended depiction of Aristotle’s Unmoved Mover. Aristotle criticized the religion of his day and through natural theology proposed the attributes of transcendent Being-Itself responsible for all of existence – a God of gods and most fundamental Cause. Even nascent Christianity, if this premise holds, didn’t claim to be a competing religion but to transcend previous understandings of religion (“I Am Who Am” and “transcendent Being-Itself” are remarkably similar ideas). The claim is that previous cultus worshipped the shadows, the men carrying the objects, the objects, the sequence of objects, or the fire that cast the shadows, but Christianity, fully understood, is the worship of that Sun to which the fire is comparable analogically. Vedanta is the only thing I’ve ever known to make a claim of even similar magnitude. We are left with the impossible mission of subsuming all actual truths and rejecting all particular falsehoods, and one error would render the Whole disproven. This leads to a certain glacial dogmatism. He is equally responsible for recognizing the privation theory’s correlative implication that all actual things and ideas contain at least some good and the implications of the idea I’ve crudely drawn out that his Tradition subsumes all traditions insofar as they are true, but excludes them insofar as they are false. Living this to the hilt leads one to a sort of reckless confidence that that which is false is other iff that which is other is false. I share this to a large extent, and, for my part, I have yet to be dissuaded. My viewpoint is immensely falsifiable but also, so far, invincible. I don’t think of this as a weakness though. I think honest confidence in my Tradition is specifically what marks me a traditionalist, and its transcendent qualities make it more a potential source of unity (katholikos, more precisely) than any tradition or, especially, any syncretism in my view. The mass of Catholics watching the shadows alone are easy fodder for the sophists behind the wall, unfortunately. Unfortunately for me, my WordPress has not been giving me notifications and I did not see your posts till today! I’ll have to read with more focus when I can. One small comment: The ‘God is Dead’ thing. Haven’t you heard of that madman who in the bright morning lit a lantern and ran around the marketplace crying incessantly, ‘I’m looking for God! I’m looking for God!’ Since many of those who did not believe in God were standing around together just then, he caused great laughter. Has he been lost, then? asked one. Did he lose his way like a child? asked another. Or is he hiding? Is he afraid of us? Has he gone to sea? Emigrated? – Thus they shouted and laughed, one interrupting the other. The madman jumped into their midst and pierced them with his eyes. ‘Where is God?’ he cried; ‘I’ll tell you! We have killed him – you and I! We are all his murderers. But how did we do this? “God is dead and we killed him”, and there is the first order of irony! Because obviously of putting the Savior on the cross. But, what he really means is that over the course of a few centuries we have, through our material sciences and to pursuing physical cause-and-effect, killed God a second time: It has been made impossible to ‘believe’ in God — the Christian God of course — and this amounts to a second killing (or murder if one wishes a bit stronger word). There is a line in a Bergman film (Winter Light) which always struck me. The priest prays (because he is struggling in his own self): “And what about those who want to believe but can’t?” That is how I understand the problem. My view is, to understand how it happened, one has to retrace it intellectually. Just as Richard Weaver points out. You have to go back to where, on the Heath, the error first occurred. One can manage something like that — mentally — but it is harder to bring oneself into ‘full recovery’ which results, naturally, in the state of Grace. In my own case I find that Lex orandi, lex credendi is working. But I have to admit it is a slow recovery.The Hymns of the Brevieary and Missal. Having a real old-school Breviary and the old-school prayer books has been essential. Election of 2016, hands down. It brought the tyrannical intolerant left out into the open. All worthy candidates. I picked Kavanaugh because it was different from the 2016 Election train wreck, which could (and arguably should) be the winner every year, probably until Trump is out of office or dies.